As their labor dispute entered its third month, workers of the biggest garments factory at the Cavite economic zone vowed to win their fight against union busting. 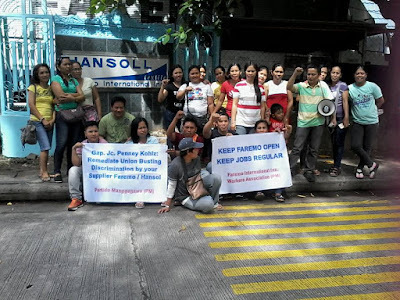 They have maintained a picketline outside the main gate of the factory Faremo International Inc. since 1,000 workers were laid off last October 27, 2016. “Faremo shutdown allegedly due to lack of orders, a claim that has been debunked by the admission of its major client, the global garments brand Gap, that purchases have in fact been increased. We are not on strike and want to work but have been locked out. We have sustained a 24/7 picket at the factory to guard against machines being taken out of Faremo. We have survived Undas, Christmas and New Year on the picketline and we are ready for the Chinese New Year,” explained Jessel Autida, president of the Faremo workers union. He explained that they formed a union in order to improve pay, benefits and working conditions and stop mistreatment like verbal abuse. Workers at Faremo, despite years of seniority, receive just the mandated minimum wage of P356.50, well below the daily cost of living which PM estimates at P1,100 per day. Pioneers at Faremo, who have worked since the factory started in 2003, receive just P1 higher than the rest of the workers. “Faremo workers are paid so cheap they cannot buy the clothes they make yet Hansoll is a billion dollar global company. Hansoll declared USD 1.27 billion revenues in 2016 and targets a net profit of 10%,” Autida elaborated. “Faremo’s spiriting way of machines is in violation of an agreement reached during mediation meetings called by the National Conciliation and Mediation Board and also of a Philippine Economic Zone Authority board resolution,” Autida averred.